(Our SCHEDULE is down below) Visit our Facebook page. Howdy pardners and lovely ladies! Y'all welcome to visit our entertainment web site. I'm "Wild" Bill Spotts and my lovely wife is Carole. Together we form the DYNAMIC DANCING DJs. 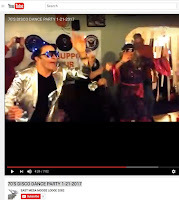 We've been entertaining dancers in the East Valley since 2003 with the very best in classic and new country, good time rock n' roll, big band and even some disco and motown R & B. We don't just play songs at our gigs. We love doing dance demos, dance skits and wearing celebrity costumes. Our specialty is engaging with the audience in participation dances that everyone can enjoy and have fun. Sometimes we'll teach a beginner level line dance or shuffle to get everybody on the dance floor. You can CLICK HERE to view our video on Youtube that shows us "at work". When we are not entertaining audiences with our DJ performance, we are veteran C.W. dance instructors. I've been teaching line dancing, partner dancing, pattern dancing and shuffles in the East Valley since 1995. We are one of the few dance instructors in the Valley who teach pattern dancing. Our winter visitor dance students love it, especially the men-- since there is no lead and follow. We are known as the Prince & Princess of Pattern dancing. We want to see you on the dance floor real soon. Keep scrolling down to see our SCHEDULE. 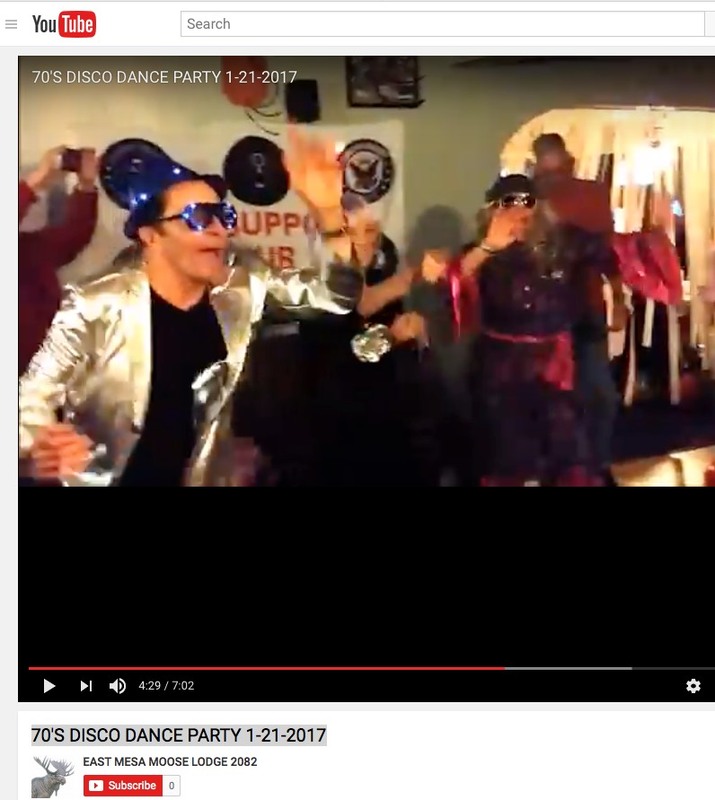 Our services include Disco parties; the Youtube screen capture at left shows Wild Bill (in the blue hat) while he and Carole were DJ'ing at the Jan 2017 East Mesa Moose Lodge -- Click Here to view the Youtube video. FRIDAYS: March 31 thru October 20 at Towerpoint Resort, 4860 E. Main St. Mesa. 6:30 to 7 pm. Fun, beginner level C.W. dance lessons include shuffles, pattern and line dances. Lesson followed by a C.W. band from 7 to 9:45 pm. Admission is still only $8 and that includes popcorn, ice and water. BYOB, of course. Dance on a large, well maintained hardwood floor. SATURDAY, JANUARY 21, 2017 at East Mesa Moose Lodge, 7402 E. Baseline Rd. Mesa. Put on your platform shoes, leisure suit and groovy threads so you can shake your booty to the Bee Gees and K.C. and the Sunshine Band. Dance contest, costume contest. Trivia contests. 7 to 10:30pm. SATURDAY, FEB.4,2017 at East Mesa Moose Lodge, 7402 E. Baseline Rd. Mesa. We will be playing a variety of dance music from C.W. to rock n'roll to disco to Motown to Big Band. Audience participation dances. 7 to 10 pm. SATURDAY, FEB.18, 2017 at East Mesa Moose Lodge, 7402 E. Baseline Rd. Mesa. The 2nd Annual Redneck Games will be played outside behind the Lodge. Hobo stew served. Will play a variety of danceable music to play redneck games. The fun starts from Noon to 4 pm. WEDNESDAY, FEB. 22, 2017 at Camillo Vista. PRIVATE PARTY. Western Theme party with BBQ dinner. We will teach line dancing and shuffle from 7:30 to 8:30 pm. SATURDAY, MARCH 11, 2017 at East Mesa Moose Lodge, 7402 E. Baseline Rd. Mesa. We will be playing a wide variety of danceable music from 7 to 10:30 pm. Audience participation dances. FRIDAY, MARCH 17, 2017 at East Mesa Moose Lodge, 7402 E. Baseline Rd. Mesa. Get an early start on St. Patty's Day from 2 to 6 pm. We will play the usual incredible variety of dance music as well as some traditional Irish songs. Hoist a Guinness Stout or a shot of Baily's and do an Irish jig. SATURDAY, MARCH 25,2017at East Mesa Moose Lodge, 7402 E. Baseline Rd. Mesa. Calling all hep cats and kittens with mittens for the grooviest sock hop around. We'll play the best rock songs from the 50s and 60s. Dress appropriately as there will be dance contests, costume contests, trivia contests. Maybe we'll do the stroll. 7 to 10:30 pm. SUNDAY, MAY 14, 2017 from 4 to 8 pm. Country Western theme wedding. Playing classic and new C.W. as well as some rock and oldies. PRIVATE PARTY. Website created 3/2012 by BilltownWeb.com , updated 2/9/2017 by Jim I.